Please welcome Dan Moren to The Qwillery as part of the 2017 Debut Author Challenge Interviews. The Caledonian Gambit is published on May 23rd by Talos. Please join The Qwillery in wishing Dan a Happy Publication Day! Dan: Thanks! Delighted to be here. I've been writing stories pretty much since I learned how to put pencil to paper. Back in second grade, my friend and I used to concoct tales about magical anthropomorphic cats and the kids who befriended then. (Funny enough, she actually went on to be a talented non-fiction cartoonist, so who knows, maybe those pencil scrawls will be worth something some day.) As for why, I've always been enamored with stories and storytelling. I read incessantly as a kid—no surprise for the child of two librarians—and I loved getting wrapped up in a story, so it seemed only natural to tell my own. Dan: Mostly a pantser, though I hate to admit it because it gets me into trouble at times. I've experimented with a few different outlining methods in more recent writing to try and forestall that late-in-the-game moment when you realize that you forgot to set up a particularly salient detail, or find that the characters have taken a sharp left turn from the road you set them upon. But I can't lie: I love the thrill of writing on the edge and being surprised at where the story takes me, even if that means I have to dig myself out of some holes when it comes time to rewrite. Dan: Speaking of rewriting, that has got to be my biggest bane. I always get anxious that my story is a carefully crafted spider web that will disintegrate if I remove or change the wrong element. That's a tendency I'm trying to combat by reminding myself that rewriting is more like forging steel—hammering on a story until it becomes even stronger than it was initially. But getting over that initial fear that your story is a precarious tower of Jenga blocks is definitely a challenge. TQ: What has influenced / influences your writing? How does your background in the tech world inform your writing? Dan: Really, what doesn't influence writing in some way? It's all fodder, from those moments of high drama like break-ups and fights with friends and family, all the way down to riding the subway to work or going to the grocery store. What most inspires me to write and tell stories is still consuming other stories, whether they be movies, TV shows, books, comics, games, and so on. When I experience a really great story, it makes me want to create something that engenders that same feeling in other people. As for my background in the tech world, I think that's given me two things in particular: first, a pretty good idea of what's plausible, as far as tech goes—that doesn't mean I always want to get down into the nitty gritty of how a technology works, since I think some people's eyes tend to glaze over, but I want the tech to at least seem feasible. Secondly, it's sparked a curiosity about how certain types of technology, especially ones we now take for granted, fundamentally change the way our entire society works. TQ: Describe The Caledonian Gambit in 140 characters or less. TQ: Tell us something about The Caledonian Gambit that is not found in the book description. Dan: While on its face this is a story about spies and space battles, it's really, at heart, about something more fundamental: family. About differences between family members, what it means to leave your family behind, what it means to stay with them and make sacrifices for them. I think that's something that's almost all of us can relate to in one way or another—certainly more so than flying a spaceship or being a secret agent. TQ: What inspired you to write The Caledonian Gambit? What appeals to you about writing Science Fiction? TQ: What sort of research did you do for The Caledonian Gambit? Dan: A lot of the research I did—and some of this was quite a long time ago—was into the structure of certain organizations: the military, intelligence organizations, and so on. Obviously, this takes place in the future, and the organizations in it aren't entirely reflective of the ones from the here and now, but I wanted them to feel right. 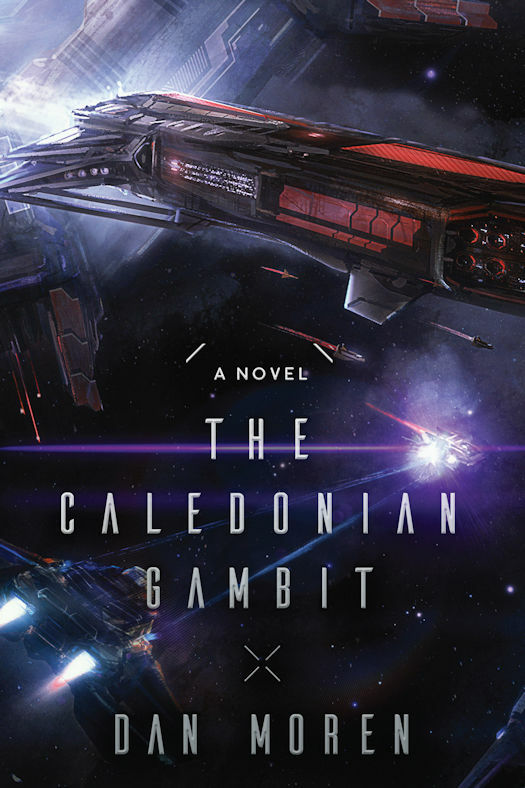 TQ: Please tell us about The Caledonian Gambit's cover. Dan: I've delved a bit into this story over on my blog, but when my editor asked about what I'd like to see on the cover, I immediately thought of a pivotal scene right at the beginning of the book: a space battle that takes place around a wormhole gate, which is how you travel between solar systems in this universe. I sent my editor an incredibly crude sketch—thanks, lack of artistic talent!—and our cover artist, Sebastien Hue, somehow managed to create a beautiful depiction of exactly what was going on in my head. I don't know how he pulled it off, but I've only been able to conclude that he's a wizard as well as a supremely talented artist. TQ: In The Caledonian Gambit who was the easiest character to write and why? The hardest and why? Dan: My favorite character to write is probably Tapper. He's the gruff sergeant, sort of the sidekick and mentor to our covert operative, Simon Kovalic. I enjoy writing him because I find his voice instantly recognizable in my head—I know what a Tapper line sounds like, how he'd say something, and what he'd do while saying it. He's kind of seen it all—or at least likes to think he has—and if he's not exactly jaded, he's at least a bit skeptical of anything outside of his area of knowledge. The hardest character to write is probably Kovalic. He's extremely competent, and generally presents a stoic exterior, but he hasn't quite become a cynic yet; things still get to him. He's also got a dry sense of humor that shines through his professionalism. The challenge is that he needs to be a more fleshed-out character than someone like Tapper, who can pop in and deliver a wry line; Kovalic, by contrast, is the main act—he's a load-bearing character, if you will. That means a lot more complexity and nuance. TQ: Which question about The Caledonian Gambit do you wish someone would ask? Ask it and answer it! Dan: "Why aren't there aliens in this universe?" Glad you asked, random person in no way related to me! While I dig aliens as much as the next person, I was especially interested in examining the relationships of these different factions of humans that have grown apart culturally. While I think aliens can often be used to provide an interesting lens of insight into humanity, too often they seem to me to be merely re-labeled humans (like on so many Star Trek episodes where they just have prosthetics stuck to their forehead so that their appearance can scream "alien!"). TQ: Give us one or two of your favorite non-spoilery quotes from The Caledonian Gambit. "If the ascent was bad, the docking maneuver was worse. Like two beached whales mating, his flight instructor had once described the process, and this pilot seemed determined to wring every ounce of truth from that quip." Dan: I'm hopeful that I'll get an opportunity to continue the story of some of the characters you meet in The Caledonian Gambit. It's a big universe in there, and there's a lot left to explore. Plus, I might possibly have dangled a couple hooks in it that I'd like to investigate in a subsequent book. Or books. If I'm lucky. I've also been working on an urban fantasy book that takes place around my hometown of Boston and involves a suspicious death tied to a big technology company. You know, just to try my hand at something completely different. Dan: Thanks for having me! It was a pleasure. And I'm glad I got through this interview without being horribly qwilled. 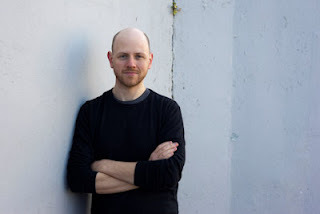 Dan Moren is a former senior editor for Macworld and is now a freelance journalist covering all avenues of the tech world. He's also a professional podcaster, hosting tech shows Clockwise and The Rebound, while contributing to The Incomparable and Total Party Kill. The Caledonian Gambit is his first novel.